Purple has a whole new meaning and it comes the form a tiny berries called acai berries. With the launch of Acai Tabloid, a new site dedicated to providing information regarding these super berries, consumers can now look forward to getting more comprehensive information regarding the fruit, its benefits as well as scams concerning the berry. The website http://www.acai-tabloid.com states facts, testimonials, latest news articles concerning the berry as well as a free trial for the acai berry. Acai berries are found in the thick forests of the Amazon that grow in clusters atop the acai palm tree. The Acai berry is likened to be a cross between raspberries and chocolate, thus giving a delicious and unique flavor. Their flavor makes them a good combination and ingredient for fruit smoothies, granola, fruit drinks, yogurts and ice cream. These small tiny berries pack a healthy balance of protein, carbohydrates, omega fatty acids, vitamin E and minerals making it to the tops list of nutritional super foods. Since media mogul Oprah Winfrey declared that the berry helped her in losing weight, the popularity of the acai berry has reached new heights and thus, it has also prompted scams to lure consumers into purchasing fake acai products. The Acai Tabloid seeks to help consumers from falling into this scam by providing valuable resources and guides, health benefits, as well as the most reliable places to buy acai berry products. Consumers can also subscribe to the website’s RSS feeds to stay up to date concerning issues on the acai berry and other health and nutritional information. Not only that, the website encourages its visitors and acai berry consumers to relate and share their experiences from using the acai berry through its comments section. The USDA Recommends that an average adult gets 3-5000 ORAC Units Daily. ORAC is the acronym for ‘Oxygen Radical Absorbance Capacity’ and most of us are getting less than 1000 a day. The Acai has very high ORAC values which are about 5500 ORAC value for just 100g. Waitrose has announced the launch of their new range of seasonal fine foods with something to suit all tastes and budgets. As the credit crunch drives the appeal for home entertaining and dining, those watching the pennies this festive period can still enjoy the finest foods with the fresh party collection from Waitrose. The new range offers an exciting collection of 38 contemporary canapés, with something to suit all tastes. This latest range includes bite-sized classics from around the world, such as traditional styled classics with British recipes like Mini Beef Wellingtons, and Mini Yorkshire Puddings filled with beef, onion relish and crème fraîche with horseradish and mustard. The Mediterranean collection includes Scallop and Chorizo Skewers, which are hand-made with slices of spicy Spanish chorizo and succulent scallops, marinated with roasted peppers, Sunblush tomato paste and parsley. Other Mediterranean favourites include the ever popular Brie and Cranberry Parcels, as well as Mushroom and Mascarpone Cups, Mini Bruschettas and Lamb Koftas. The Oriental flavours which are on offer include Mini Salmon Fishcakes with a garlic and ginger dip, Mini Duck Spring Rolls, Spiced Chicken and Cashew Cakes and Paper Prawns. The new Christmas recipes party food collection will be available in Waitrose branches from November 17th ensuring anyone can lay on an impressive buffet spread for their New Year’s celebration with minimum effort. All items are suitable for home-freezing too, so they can keep be kept in the freezer through Christmas and into the New Year, and of course all come with the assurance that they are made with the highest quality ingredients. The new party food collection will be available in Waitrose branches from November 17th About Waitrose Waitrose has 191 branches in its estate including stores in Wales and Scotland and has just been named Britain’s Best High Street Retailer at the Which? Awards 2008 and Supermarket of the Year by the RSPCA at its Good Business Awards in 2008. The food shop has won more major wine awards than any other retailer and was named Supermarket of the Year 2007 at the Decanter World Wine Awards. Highland Fayre, the premier Scottish hamper company for luxury corporate gift hampers, has just released a brand new range of hampers. The new Highland Fayre hamper range is set to offer a wide selection of goods, including the company’s Royal Banquet, which contains a selection of their finest wines and gourmet food. There is also variety of Scottish hampers, chocolate gift boxes and the traditional port and stilton selections, as well as cases of wine and champagne hampers. 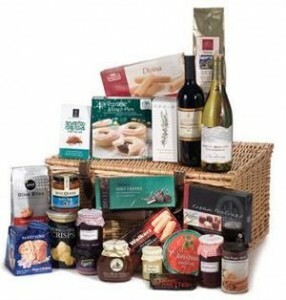 Highland Fayre is also continuing to offer customers the bespoke hamper service, as well as the new range of hampers. 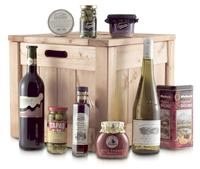 The service offers clients the ability to specify the contents of their hamper, as well as the style of packaging and type of delivery service. 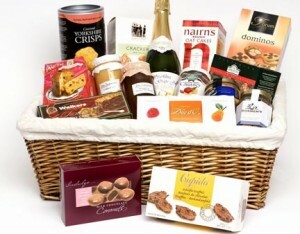 A large selection of food is on offer and hampers can also be tailored to particular food and drink types. The popularity of Highland Fayre hampers abroad can be attributed to the company’s ability to arrange delivery of their hampers throughout Europe, and its partner hamper companies in the USA, Australia, New Zealand and South Africa. Highland Fayre Ltd is the premier Scottish hamper company for luxury corporate gift hampers. Highland Fayre was established in 1985 and has since developed a high quality reputation within the corporate gift market. Highland Fayre extensive experience of supplying bespoke hampers and gifts allows their dedicated team to gauge instinctively which luxury items recipients most like to find in their hamper or gift box. Highland Fayre offers a selection of luxury gift hampers that includes wine gift boxes, themed hampers and luxury Christmas hampers for all ranges of budgets. Eight years ago Susan Knapp began making Cinnamon Pear Jelly in her kitchen as a holiday treat. When she realized there was a demand for her healthy and delicious pear creations, she left her lucrative executive position to focus on building her own gourmet food company. Knapp launched Aunt Sue’s in 1998 with four products, each one winning top awards at the Lake County and California State Fairs. As the company gained momentum, Knapp changed the name to A Perfect Pear from Napa Valley and introduced 15 new products. Now, major wholesale customers include Whole Foods, Bristol Farms, Disney, Luxor Hotel & Casino, and the United States Navy, in addition to hundreds of boutique retailers, wineries, restaurants, and caterers across the nation. With product rapidly flying off the shelves, Knapp finds herself in a unique position: over $100,000 in pending holiday backorders and not enough cash in reserves to manufacture. The rising costs of raw goods and the current credit crunch had brought a rapid halt to production, and yet, the customers are willing to wait. Natural Nutrition, Inc. (Stock Symbol: NTNI), www.naturalnutritioninc.com, announces the launch of 2 new product sites by subsidiary, iNutrition, Inc.
A major announcement regarding the structure and compensation program for the iNutrition affiliate business opportunity was postponed due to Hurricane Ike’s disruption of business at Natural Nutrition offices in Houston, Texas. Details on the affiliate program will be announced in October for all inutritionopportunity.com members. First Alert e-mail notices will be sent to anyone who has signed up at the site. All natural, fast and easy weight loss formula,Metabolean, is the latest product to be offered online by iNutrition. The web site metaboleanweightloss.com features videos, full product information and secure, easy ordering specials. iNutrition’s healthy snack and meal replacement product, Fission Power Energy Bars, are now being sold at fissionbars.com. Made with real fruit, soy protein, no corn syrup, no refined sugars and with only 150 calories Fission Power Bars represent “The Perfect Healthy Snack” and a popular school or office lunch addition. Videos featuring Seinfeld Actor and Dancing With The Stars Champion, John O’Hurley, and other iNutrition spokesmen and women can be seen at all the iNutrition web sites. About iNutrition.com – Dedicated to providing all natural nutrition secrets for a long healthy life, iNutrition.com offers anyone, anywhere easy and fast online access to the latest top weight loss, fitness and good health products. About Natural Nutrition Inc. – iNutrition.com and InterACTIVE Nutrition International Inc. (interactivenutrition.com) are wholly owned subsidiaries of Natural Nutrition, Inc. (Stock Symbol: NTNI). InterACTIVE Nutrition is a manufacturer and international leader in sports and nutritional supplements backed by over 12 years of research, development and sales of sports nutrition products in over twenty countries throughout the world. Venulum, private wealth management firm based in the British Virgin Islands, has successfully managed to breed Caribbean Spiny Lobsters in commercial quantities in controlled conditions in the British Virgin Islands. Significant recent catches of juvenile lobsters have been heartening. It is too early to say whether these numbers reflect the early season peak in numbers or the average settlement rate. When compared with previous research, the highly regular settlement rate matches that of the average settlement during a small-scale investigation between 2001-2003. Giles Cadman, chairman of Venulum said: “It has taken us nearly two years of careful evolution of the collection process but we should now be capable of replicating it throughout the Caribbean, Australia and Asia to provide numerous business opportunities to fishers and young entrepreneurs. The lobster farm has been built at the Pockwood Pond site on Tortola, the largest island in the British Virgin Islands, and should be fully operational once hurricane protection has been completed on-site early next year. The farm site is progressing with general finishing and fabrication work moving to completion. The Venulum management team has approved the construction of a mould for large-scale fabrication of tanks according to precise requirements. Experimental storage systems have been deployed in favourable deep water locations in the hope that these will be useful as holding accommodation for ‘post larvae’ while farm infrastructure is completed. If effective, Venulum hope these devices will prove vital in reducing the cost and time commitment of early culture operations. He adds “Caribbean Sustainable Fisheries also intends working with local communities to build small scale lobster farming operations offering business opportunities to fishermen whose wild resource has been depleted to the point that it is no longer viable to continue fishing. With the steady progress to date, we can look forward to the first market sized lobsters in around 18 months from now. The Venulum Group is a multinational private wealth management firm headquartered in the British Virgin Islands. The Group manages the wealth of high net worth individuals, and specialises in alternative investments often not available to the general public. Venulum helps high net worth individuals balance their portfolios. The Venulum Group was formed in 2002, and has expanded to include offices in four countries, with service offices in a further two. Since 2002 Venulum’s client base has expanded rapidly, and now has a substantial number of United States based clients.